PROJECTED CORK DECOPROYEC is an ecological watery base covering whose main component are cork dust from cork oak as well as resins from organic vegetable pigments. The main advantage of applying this product is that, although it is a covering, it can also offer effective waterproofing and insulating properties, as well as being flexible and breathable. 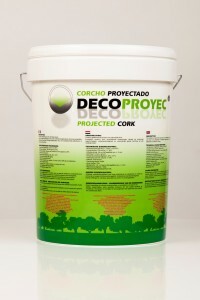 PROJECTED CORK DECOPROYEC is packed in light plastic bags, manually sealed and inserted in covered sealed containers. It comes in 11-Kg buckets. The preparation process consists of taking the product from the plastic bag in the bucket and stirring it until the necessary fluidity and density is met. PROYECTED CORK DECOPROYEC application is made with a filt-gun. The surface must be clean and dry before application, and any cracks in the surface must be repaired using any kind of filler. See the manual use and application here. PROJECTED CORK DECOPROYEC has a grainy but aesthetic finish, with waterproofing and breathable properties, which is the reason why it is allowed to be used in any construction sector, with a recommended thickness of 3mm. PERMEABILITY Waterproof without any capillary activity. If you want to know more details of product certifications and the company, you can contact us and request any information from our contact page.